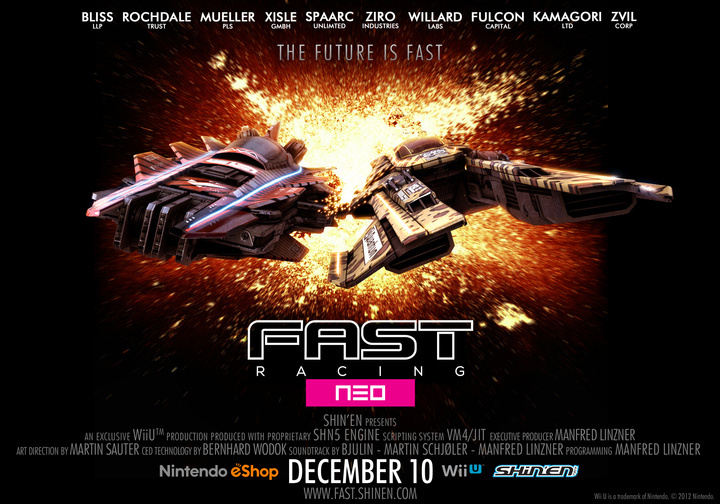 It's an eagerly anticipated Wii U eShop exclusive, and now Shin'en Multimedia has finally confirmed the launch details for FAST Racing NEO; the good news is that we'll be on the grid soon. It will arrive in North America and Europe on 10th December, and even better it'll be at a rather reasonable €14.99 / $14.99 / £10.99. Shin'en has even released a snazzy movie-style poster to celebrate the occasion. Are you excited about FAST Racing NEO on the Wii U, and will you be picking this up on 10th December? Let us know. I feel a cold coming on...so I'll need the day off...on 12/10! SO I was wrong, it's new, but not HUGE news like they were touting, HUGE news would have been a release tomorrow! but one more week can't hurt. I was reafy to pay 20usd. Well, I'm buying it and also are my friends. I also reserved a spot on my streamings for this game, it's gonna be really fun!! Wow at that price I genuinely feel like I'm getting it at a steal! That's theoretically great value for this game, this is putting most other Retail games to shame it feels like and I'm getting it for £10.99! Reckon I'll buy one for my only other Wii U friend as well, Shinen deserve the money. I hope this week passes quickly! I'd buy it now if I could. Art of Balance is one of my favorite Wii U games, but what Shin'en have created here is on another level. Great stuff, same day as heist though. Hopefully I'll able to afford them both day one. Very satisfied with that price! Next week isn't soon enough though! Now we just need the file size so we can see how absurdly small they've managed to make it. Day one! Feels like pod racing in Star Wars The Phantom Menace. I'm gonna wait to find out how much depth this has. I like the look of it, but all the interviews and videos are just marketing. Let's see some reviews, and, with respect to NL, I'm going to be looking at sites that haven't followed the game's development as closely as NL has. I'd pay 50 for a retail release. I really don't know. I liked F-Zero but not so mich Wipeout. I really wish there was a demo to try out. It looks really cool but its all down to the feel of the racing. Cant wait. Was hoping this awesome news would be that the game is out now for download like a big surprise. But beggars cant be choosers. Will be picking this up day one. You here that Nintendo? A futuristic racer is released for wii u and most people wish to purchase it day one. You wouldnt happen to have any sort of Futuristic Racer that you could make do you...? I think there have been demos of all Shin'en games. Sometimes they don't come out until a while after the actual game though. Easygoing price for a game of this caliber. It's closing in soon. I'll wait for a discount, with 2 Forza game and Mario Kart 8 I'm satisfied with the racing games I've got, though £11 is very reasonable. Hopefully the F-Zero fans (which I'm not one of) are happy with this as an alternative, it's been too long since GX and with no new on on the horizon (ironic considering that's one of the racing games I'm playing right now lol) this will keep them happy. Happy nough hopefully that they STFU about it for a few months joking guys I'm on your side. Cool, an actual release date! Really excited for this and will buy day 1 irrelevant of when the Smash Direct is (I'll be shocked if the Smash DLC is over £70 so I'll be able to get that day 1 too ). I'd rather see some reviews than a demo. I feel like reviews can be a lot more informative than playing a small section of a game. I dunno if I can justify this and Heist both at the same time when I'll most likely be getting eShop cards for Xmas. Grrrrrrr. Day 1 purchase if the review is favorable. Price is great value. Considering all the build up to this release I was expecting a £20 price tag. Let's hope they allow reviews prior to release. Oh, good! I'll probably get A-Train alongside this. Amazingly low price. I was expecting a higher price tag on this one. Day 1 of course! I was expecting it to be more expensive than that. I will be picking this up for sure! Much cheaper then I thought. Makes Hiest seem a bit of a stretch over this that day but at least it has a discount. Goid luck to both as I will be picking both up. Booking off the 11th from work right now!!! Wow a 1 week notice? I'm shocked, but in a good way, great to see it coming out so soon for all those who have been waiting forever. (Way back in Oct 2013 Shin'en said it was due out in 2014 so I feel your pain.) And $15 looks great consdinring allof the $19.99 games recently. Not my thing, but I woudln't mind that poster as my Wii U wara wara plaza background, very well done. Congrats to everybody, the developers and the fans!! Not even a self-consciously low scored review can put me off getting this as soon as it comes out. An amazing price. @chardir I know. I'm setting up a Wii U for my Nephew next week. I think I'll buy him a copy too! Both of my most anticipated eShop games are coming on the same day! Best early Christmas gift ever! Great price. Completely proved me wrong. I think, they have made the right decision. Lots of people are gonna buy this game for this price! It's not gonna be a Day1 purchase for me, as I planned. Because it's just 1 week after Xenoblade Chronicles X. Can't play both the games. I thought it would release at the end of december. I really expected this game to be twenty bucks considering that it is a top-tier E-Shop release so this makes me alot more eager to buy it. I hope this game performs well because judging by the footage that I have seen the team really deserves some success to reward their hard work. well, shoot. now i have to decide between steamworld: heist, and this game. I'm not complaining, but does anybody else think its weird that this game is $14.99 when heist was $19.99? I was always gonna get them both, so it'll make no difference to my wallet, but still it's kinda weird. Cheaper than I thought! Any idea of the file size? This looks like a great diversion from the slow paced Xenoblade. Count me in! And the price looks very sweet! Nice eleven quid, bring it on! Well now I have to buy a game to tide me over for a week! I just can't wait! Too much want! Such hype! But yeah, day 1 buy for me. Yep day one purchase for me. @andreoni79 If their previous releases are anything to go on, file size will be comically small somehow. No idea how they crammed that much visual goodness into Nano Assault Neo with such a tiny digital footprint. Fab, day one for sure, but with Xeno X and Samurai Warriors IV before me I don't know how much I'll be playing it before year end. I want that poster and to kick all of your tails online. Thank you Shin'en for giving us what we want! Really hope this is great, but people seem to be getting really excited purely based on it's genre. There's so much more to making a good game that using great games as your influence. Good price for a game like this. As i always said. Day 1 purchase, but also to support this developer. The one game that will keep my Wii U from constantly booting up "Xenoblade Chronicles X" during December. I hope this does well and Nintendo watch the sales. It could lead to another F-Zero. Wow. Really surprised at the price! WHAT?! Only 15€? I was sure I would have to at least pay twice as much. Awesome, just a week away. I'm very excited for this! Cheaper, Smaller and Faster!!! These guys rock. Yes. But was hoping for a release Thursday! And great price! @RoomB31 There was no way they were going to release a game that has been in development for 3 years, in the same week that XCX launches. A Demo would have been nice though. I think it could have put a lot of people who are on the fence about the game, at rest, and allow them to see what an awesome title it is going to be (hopefully) . that's a tough sell, one, XCX is a GIANT rpg, that is overwhelming in scope, Fast racing NEO is a hyper speed futuristic racer, not exactly butting heads. I'd make your argument if it was Mario kart, heck if it was any other Nintendo IP, but Nintendo hasn't been promoting this game, this isn't the "We better not overcrowd the XCX launch" honestly, they can both coexist at the same time for the fact that they're so different, and for the fact that one is an indie game. I know I would have bought it this week, but am not convinced by XCX's intensely overwhelming even daunting gameplay. Sold! Thanks Shinen for not being greedy. I've been interested in buying this game, but I need to start saving my money for the summer term. Xenoblade Chronicles X will be the last game I buy for 2015. @RoomB31 What are you talking about? Nintendo has promoted this game quite heavily. I don't know why you guys were expecting a price of $20 or more. I always knew this game would be $15; I'd be shocked if it wasn't. I'm so much buying this around Christmas. Hope to race around with... well, some of you. @RoomB31 Nintendo pushed this game like crazy at E3. They have also showed it in the last Direct. The fact it is NOT a first party game, is the exact reason they would not launch along side XCX, which is almost a 2nd party game. And to price it so low, after 3 years of development, they want to maximise their sales. A LOT of owners will have been saving for XCX, and probably wouldn't have the extra cash to buy both at same time. Amazing!!! I thought it would be like $20.00 or something like that. I hope there are a lot of people playing online. I just would like to know the number of tracks and vehicles. This looks amazing and at a good price. After Xenoblade Chronicles X yet another solid must-buy/must-own game for Wii U owners and with this price point you can hardly go wrong. Shin'en nearly always delivers the goods, so chances are that this is another gem in their long list of enjoyable games. there's a difference between watching it at E3 or in a Nintendo Direct, I was talking about marketing, but I was also talking about XCX. Can't believe the price after the loooooong development... I assume paid DLC is planned? Right E3 and directs, not marketed in anyway by Nintendo, also I was referring to XCX, which even Nintendo said they wouldn't market it because of its niche (subset of gamer) appeal, which is a really strange thing to do, but that's Nintendo for ya. Still not launching a game because another game that is in no way competing for it (except for maybe time) doesn't have to be reality. My whole point was that They said they had HUGE news, and HUGE news would have been that they were releasing the game this week, telling us instead that its comping next week, is news, but its not HUGE, since we already knew it would be out before XMAS. While I myself am not the biggest F-ZERO fan, some of my friends are and I am really looking forward to playing some online matches with them. Just like in Mario Kart 8. @holygeez03 There's no reason to assume that at all, since Shin'en always delivers their games 'as is' so they are always complete. If they, for whatever reason, do decide to make some DLC for this game, then it will truly be an extra and will not be hidden in the game to render it 'incomplete' when you first buy it. I never said anything about the game being incomplete... but it is my assumption that the aggressive pricing is along the lines of modern strategies to increase the install base and then recover additional revenue per user with future DLC. I don't really have a problem with this since it allows people to by a fully functional game for $15 and then decide whether or not to spend additional money later. I gladly paid for the additional MK8 tracks and would continuing doing so in that format... however, I HATE the micro-transactions for the additional Smash content, which is annoying to shop, adds up quick, and doesn't bring that much more to the game. @holygeez03 Ah, I misread you there, then. Most people bringing up DLC as a point of criticism always make the claim that it is some kind of scam or indeed a trick of the developer/publisher to sell them an incomplete game. which is why I said what I said. But anyway, Shin'en has never done anything like that before and their games have always been decently priced, so I'm really not expecting them to stray from that path. Sometimes it could be viewed as scam, or trick... but it is always a strategy, if employed. If Steamworld Heist developers had ideas for future DLC that people would actually buy, they could probably lower that price too. @holygeez03 It actually started as a thank you to players for buying the developers' game, and also as a way to incorporate extra levels and stuff into a game that for some reason didn't make it to the deadline, but the developers still wanted to release to the public anyway. It was only in later years and with bigger publishers who saw the money in it that things took a turn for the worse and some of them indeed started to lock away parts of games behind micro transactions and DLC keys. But again, Shin'en is not such a company, it would be a first for them. I have all their games and all of them have always been decently priced, so let's just wait and see what tricks, if any, they have up their sleeves. 1st priority 2016.... New HDD for Wii U!! I am glad its this month and the price is very fair . Early birthday present for me:) can't wait for this and will gather friends for split screen mayhem! Wow, way sooner than I expected...will be getting day one! To be blunt, that hasn't stopped us sharing critical reviews of the likes of Mario Tennis: Ultra Smash and various others. Reviews are always a separate aspect, as it were. Up to you, anyway, but ultimately doing interviews etc doesn't affect a review, but if you don't want to believe me that's your prerogative. Nice, I will be getting this but I am tempted to wait for Heist until the Wii U version. Need to get Guns, Gore and Cannoli on PS4 and that releases two days before. Well this just might be rounding out my Christmas this year. It will all depend of whether NoA gets it's act together for the holidays ( yeah right). that game looks so polished and they could easily take the normal retail price. Good price, and we're so close to the release as well! I have had one eye on this game for a while now and I am impressed at the price point. If it gets good reviews and has decent online racing I will be sold. For £10.99 I'll buy it twice. Any news on download size? Knowing Shin'en it'll probably be unbelievably small. I was fully willing to pay up to 30 bucks for this. But the low price is smart to ensure the online is nice and active. @Peach64 I'm not excited because of the genre. I'm excited because of the promising video footage and impressions of those who have played it. Please please please be the game I hope you are! I just hope this games sells well enough to show Nintendo how much we're missing F-Zero. HOOOOOOLY BATMAN ON A CHRISTMAS TREE!! Is this price tag for real?! I was ready and prepared to pay twice the asking price, and now you're starting the game at just 15 bucks?! Take ALL of my money, Shin'en! Also, perfect release date! One week of nothing but Xenoblade X will mark my limit, so this game will be the perfect change of pace for me and my friend! I'm afraid you're going to be disappointed when this game sells less than 1M worldwide. Even Wipeout doesn't sell well on PS consoles either. Price is too low. I will never really say that but this is a special case. Freedom Planet, Gianna Sisters, Chasing Aurora, Chariot,.... and then Trine 2, Swapper, Swords and Soldiers II and all the Wii games cost more. Clearly this is a retail quality title and they're underpricing it, a shame. Busy with XCX but I will get it Day One either way. I've been waiting for this for a long time now. A better price than I thought - I was expecting £15-20. I have a feeling this is going to do pretty well, and plus it means I don't need to top up my eshop balance to buy it. I'll wait for some reviews first before splashing out on it. Great price well done! Just needs voice chat in multiplayer! Gotta give people time to need a break from XCX. @ThomasBW84 I'm sorry that that's the way you've chosen to interpret what I said. I'm obviously going to be reading NL's review, but I'm going to look at some others as well for this particular game. The value to me of this game will come down to how well it handles and how much longevity it has - two aspects that can be interpreted differently by different people (there doesn't have to be any suggestion of 'dodgy' reviews, so I'm going to wait for a broad appraisal of the game. @gcunit Of course, fair enough. As a rule I suggest everyone read multiple reviews for every game, that's what I do! $15 is a great price. Was expecting $20 at the bare minimum! Hooray. Thanks peach64 for the minority report, its always fascinating reading;) people are stoked by this because shinen have such a good track record andthis is a sequel so we know damn well it will be polished, challenging gameplay, not to mention gorgeous looking with a thumping soundtrack. Hurray! F-Zero finally got a release date! I was buying this game day 1 anyway but wow that price......... The devs must be feeling that Christmas spirit...... I hope all here purchase this game, the devs deserve it. Lots of positive comments on this one. Will check the review first but I'm quite sure I will be buying. Hope this sells well too because the quality of the game looks fantastic for the price. Well, looks like my memory served me, and it's coming to Europe and NA on the same date! @manu0 I'm surprised you're not shouting from the rooftops! Why didn't they just make F-zero? That's a fair price. Looking forward to downloading this!! Oh shinen why do you torture me so? I will be neck deep in Xenoblade Chronicles x when this releases but I still want to support shinen. If money isn't too tight next week I'll buy it on day 1 even if I'm not going to play right away. I can't believe it's only $15. It looks every bit as good as a $60 retail game. @FX102A - I'm the same. Loved F-Zero but Wipeout didn't quite grab me. Will still pick this up some time in December though; £10.99 is the deal of the year. Anyone know the Australian price? Oh oh oh, so going to a day one perch.